in the town for shopping, restaurants, food courts, Coffee shops, pubs, entertainment & business. 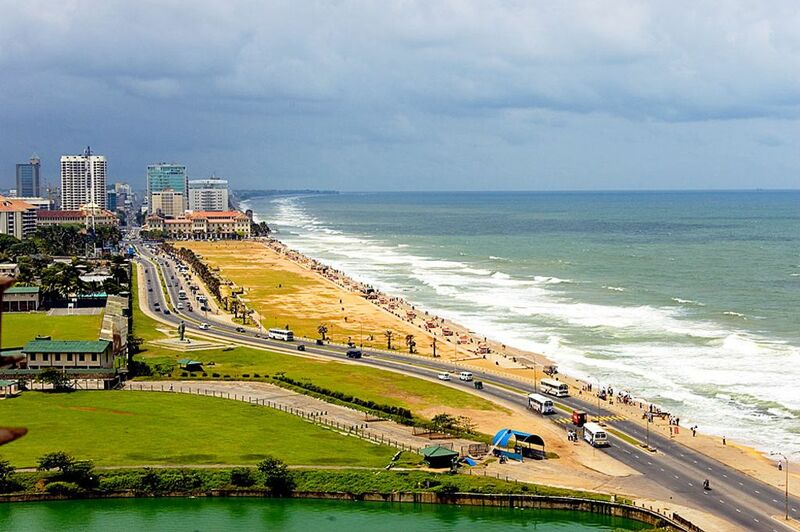 From the Emperor it is very easy to access any part of Colombo and the Country. I have a very trustworthy and pleasant team to make your stay safe and comfortable. Over 50 local and international channels. We started our month-long trip to Sri Lanka with 5 relaxing days in this comfortable apartment and also returned for our final 4 days. It is well located next to the Cinnamon Grand Hotel and with views across Galle Face and the ocean. It is within easy travelling distance of key tourist sites. The apartment is clean and spacious with a small but well-equipped kitchen, two double bedrooms and two bathrooms, one ensuite. The principal bedroom is very light and has great views. There is good air-conditioning throughout which was very welcome as we were there at a very humid period. There is a good TV package and reliable wifi. The apartment block has a large pool at a good temperature for swimming and a reasonably well-equipped gym. The building and the area feel very safe and secure. On our first day we were met by Ranie who showed us how everything worked and was also kind enough to walk us to the nearest (very good) shopping mall and supermarket, a few minutes away. The mall also had a choice of restaurants, providing a choice of takeaway opportunities. Also a very reasonably- priced walk-in massage centre whose head and foot massage I can highIy recommend. I also used the spa next door to the complex which offered an excellent variety of full body massages. We didn't truly appreciate just how comfortable this apartment was until returning from our travels around the country. It was a huge relief to return to its cool, clean comforts! Annick, the co-owner, was very easy to deal with and always very prompt and helpful in her responses to questions. Should we return to Colombo we would definitely return to this apartment. Highly recommended! Very nice, upscale building. Great location and staff. Plenty of space. Good internet and English television. Full kitchen facilities. Parking spot if needed. Transportation is easy to anywhere in the City. Would definitely recommend. Much better value than the nearby hotels. The only draw back was on the night of the 8th, the adjoining apartment played extremely loud music till 1.30 am. Could not get any sleep as I had a journey to start at 4 am. I was delighted that you enjoyed your short stay, but I was sad to learn that your first night sleep was disturbed by the noise. As per 'Residents' Manual' section on NOISE (copied below), 11pm to 6am has been set as NO NOISE time zone. Emperor residents are extremely respectful and obliged to maintains noise free, peaceful environment . Emperor 24-hour,7day security and help desk teams are there to assist residents in any difficulty. 1. Noise within the Unit shall be kept down to a level that will not cause a disturbance to other occupiers of the said Building and the volume of all audio equipment, musical instruments etc shall be maintained at a reasonable level in keeping with the applicable regulations. 2. The Owner / Resident shall not use any equipment that causes undue vibration within the said Unit. 3. The Owner shall not play or permit any person to play any musical instrument in the common areas. 4. Residents shall exercise extreme care about making noises caused by any carpentry, repair works or the use of musical instruments, radios, television and amplifiers that may disturb others. 5. Loud personal conversations on the phone from the balcony & common area, has to be minimized. 6. Noise pollution (this includes late night parties and honking) needs to be avoided. We need to be cautious that our enjoyment does not become a cause of nuisance to others. 7. 11 PM to 6 AM has been set as No Noise Time Zone, and each resident has to abide this rule. The rule is relaxed only on special occasion and only by the Management Corporation (MCCP 8128) approval. Thanks Monika, It was great pleasure to welcome you, thanks for writing a lovely review, Hoping to see you soon. *Check-in is after 14 hours (2pm) and and check-out time before 11 hours (11am). However, for the convenience of the guests, alternative check in and check out times can be pre-arranged depending on the availability of the apartment. *Night attendance charge of £10 (Sri Lankan Rupess 2000) is payable to the attending agent for any check-in or out during night hours between 18h-07h. *'Published rental price includes all service charges, Utility costs (for water,Gas, Electricity), Broad-band & Wi-Fi, Car Parking, landline phone (incoming calls) and for common facilities, Swimming, gym, Jacuzzi,etc. **Only guests included in your confirmed reservation are permitted to access Emperor building and to stay at the apartment.